Other: Japanese name "Bad Shark"
I've been writing about Gormiti which reminded me of Battle Beasts... so why not look at the real thing? 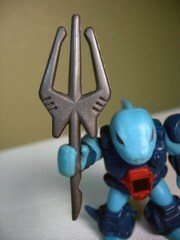 This figure, and the next two, are all some of my childhood toys. I really dug these, they were lots of fun and have been with me for a very long time. 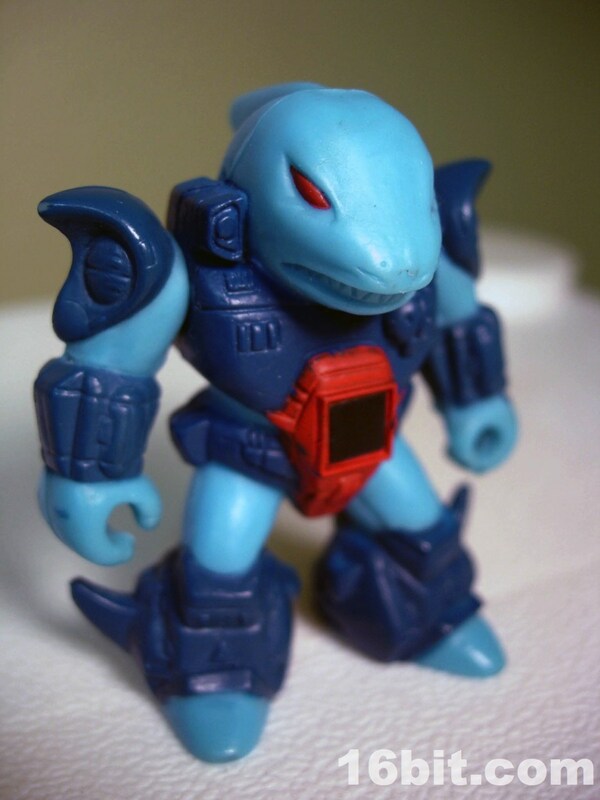 And late last year I decided I needed to get the rest of 'em, so yeah, stay tuned to read lots more about Battle Beasts over the coming months. 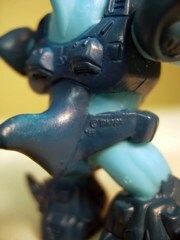 Battle Beasts are one of the best, yet sadly forgotten, small figure lines from the 1980s. The original television advertisement probably drilled its play pattern of "WOOD BEATS WATER!" into the heads of every child who dare see it. 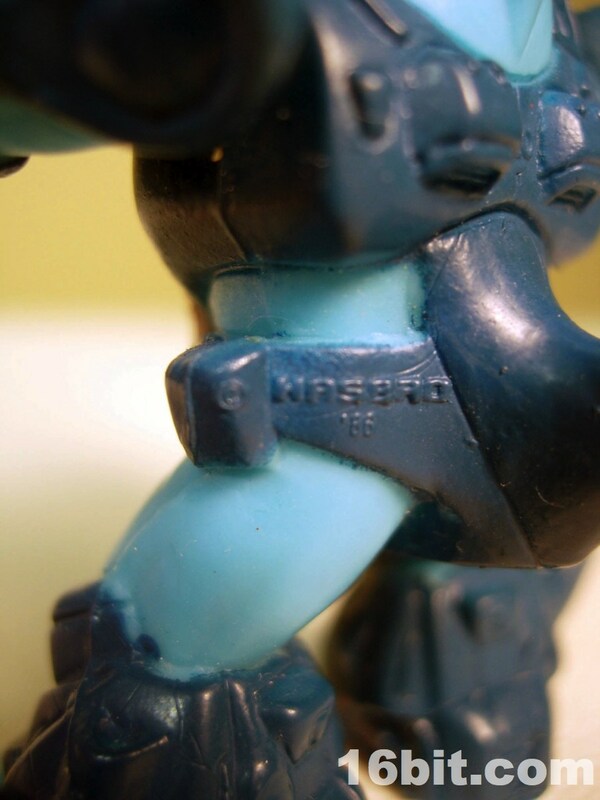 The premise of the toy line in the USA was simple-- each figure had a black sticker on his chest which, when heated, would reveal a symbol showing an icon for water, fire, or wood. The figures would then "fight" through a simple clone of paper-rock-scissors, in which water could defeat fire, fire could defeat wood, and wood (for some reason) could defeat water. 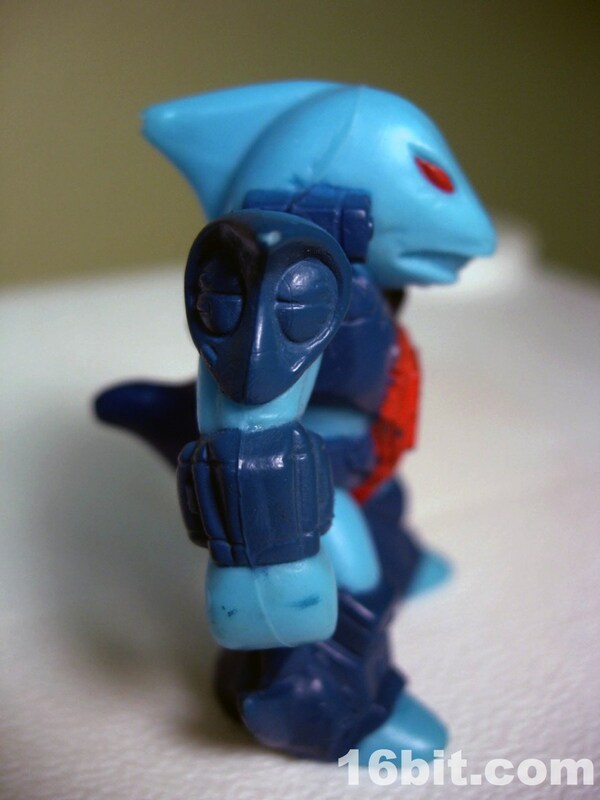 The stickers were more or less randomly applied to figures, so while my Sawtooth Shark had a very sensible "water" faction symbol, another series 1 figure like Hare Razing Rabbit (at least from my sample) was also water. Maybe your Sawtooth Shark has a fire sticker. I have no idea why, it's not like there's some Tibetan tribe of swimming rabbits, is there? 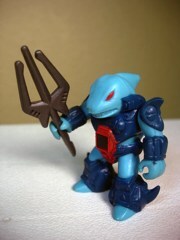 Sawtooth Shark is a blue action figure which was sold in mini-figure 2-packs, although the combinations varied. You get a fight in every pack, with a clearly defined winner and loser. 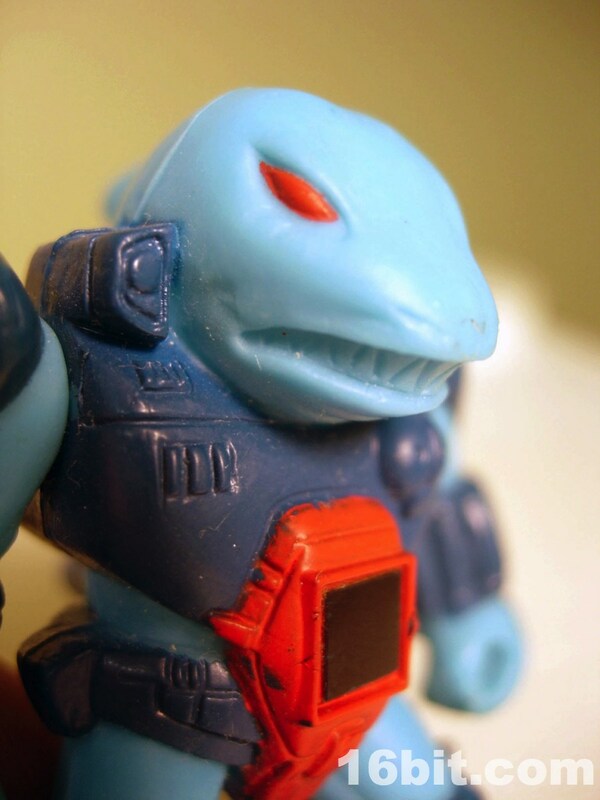 The only reason to keep buying (other than collecting) was to raise the self-esteem of the poor fire creature packaged with your water warrior. Surely, he would win next time! Anyway, the sculpting on these little guys was done by Takara, and the heads (specifically the eyes) show the influence of robots and other Japanese toys from the era which came out of Takara and Tomy. 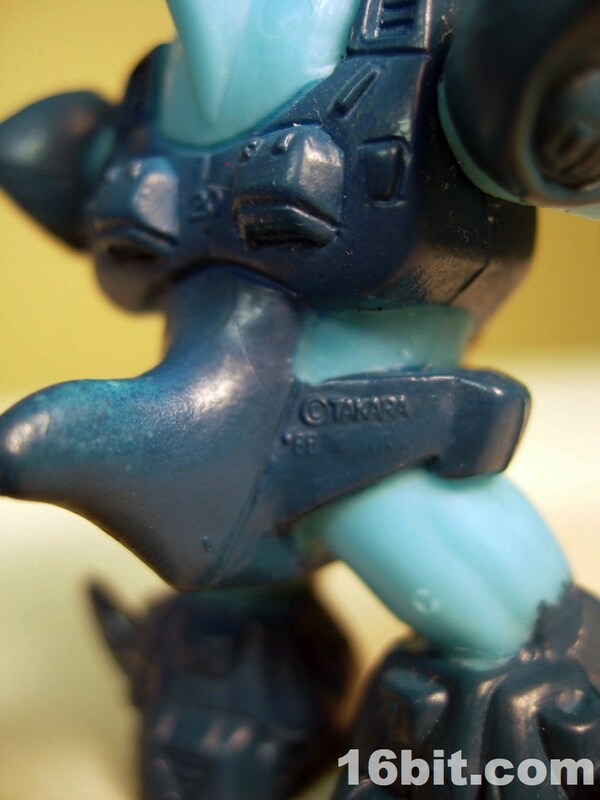 Hekc you can see some of the Battle Beasts in the Headmasters cartoons from Japan. With only two joints, this was-- in every sense of the word-- a cheap figure. 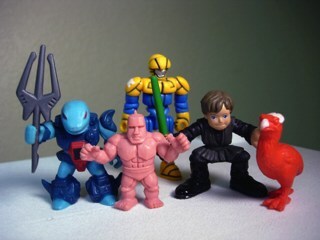 Unlike M.U.S.C.L.E. 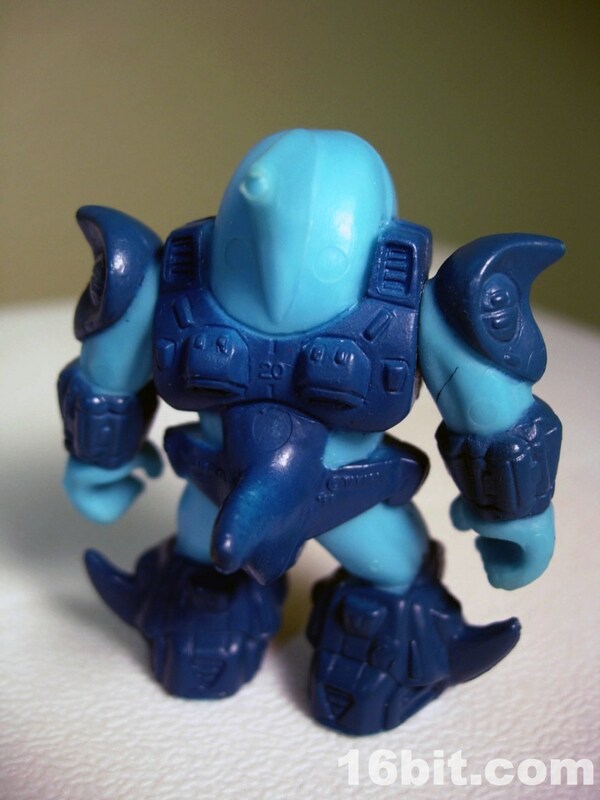 or other "collectible" figure ranges, the figures were painted with 2-3 colors per plus they were armed with some form of melee weapon. 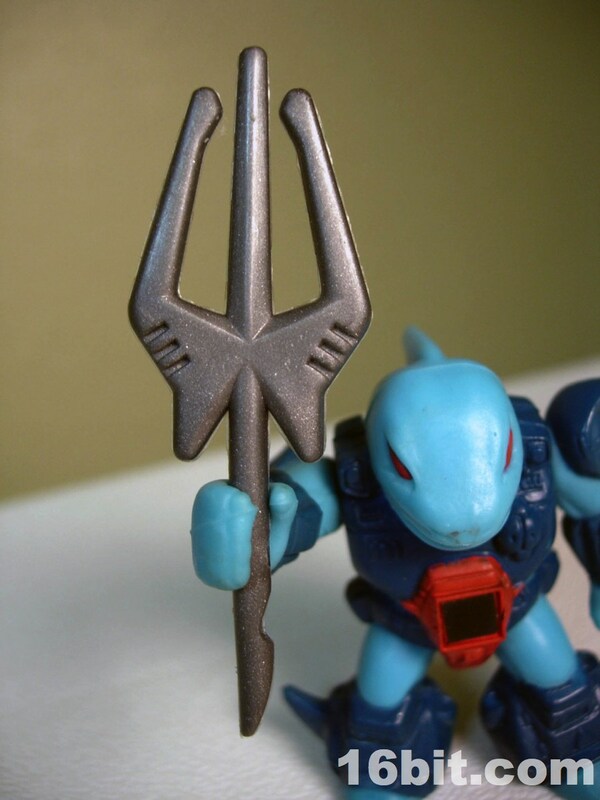 * In the Sawtooth Shark's case, he was armed with a swell (and appropriate) trident which fits nicely in either of his fists. He's covered in robotic armor, plus has a dorsal fin, a "tail" under his aft armor, vents, bolts, and other panels. I remember wondering as a child "Why doesn't he have something to help him breathe on land?" I'm still wondering. 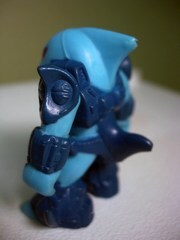 What I do know is that the red eyes sit nicely in his blue head, and his dark blue armor looks nice, too. Granted, when I think "shark" I usually think grey, but I guess this fishy fellow has to sell the notion of water given the fact he has feet. In lots this figure sells somewhat cheaply, individually he'll set you back about $10. I don't think that's an overly unreasonable price for a good specimen of a 20-year-old toy, and today a new figure of this quality would probably set you back a solid five bucks or maybe $8 in a two-pack. Hooray, inflation. He's a favorite of mine, and it depresses me that I kept him packed away for the bulk of the last two decades-- but this did assure me he'd be in good condition to write this review. * - Laser Battle Beasts, or Shadow Battle Beasts, included guns-- but you probably won't see many of those on your collecting travels. Heck, I never got any until this year. Got some? Sell them to me. I'll give them a good home.